Is a man the sum of his memories? If so, what happens when he loses all of them? This is the ordeal that Alexandre Tourneur (Roy Dupuis) faces after waking up from a long coma during which he was declared clinically dead. Struck with a wicked case of amnesia, Tourneur can't remember a thing: not his failing marriage, not his unhappy daughter, not his job as a veterinarian, not his friends and not even his drinking problem. On Friday, March 23rd, Rhode Island audiences will have the opportunity to see “Mémoires affectives” (“Looking for Alexander”) a gripping and compassionate drama about a man who feels like he was born yesterday. The film has its United States premiere when the Rhode Island International Film Festival (RIIFF) presents its annual “First Look” Birthday Blow-Out Benefit. The event is part of RIIFF’s Francophone Month screenings in collaboration with the Consulat Général de France à Boston. For the past three years, RIIFF has held an unusual fundraising event: a First Look at new and cutting- edge film work, while hosting a party to celebrate staff and friends who have made the Festival what it is today. Call it cake meets film with a champagne toast along the way. This year, RIIFF salutes Jon and Betty Jane Berberian, owners of the Columbus Theatre; RIIFF Board members, Larry Andrade, from Pawtucket and Dr. Gerald Lamoureux of Woonsocket; and Marc Olechnowicz of Newport. A cake cutting, reception and tribute will take place before the film screening. The party launches at 6:00 p.m. on Friday, March 23rd. The film screening will take place at 7:30 p.m. with the RIIFF premiere of “Mémoires affectives” (“Looking for Alexander”); an amazing work out of Canada, courtesy of le Dèlègation du Québec à Boston. Admission for the party and film is $25 (special student rate of $15); admission to the film alone is a recommended donation of $10. Francis Leclerc’s taut thriller “Memoires Affectives, will inevitably draw comparisons to Christopher Nolan’s “Memento” purely by virtue of the film placing an amnesiac in the lead role. But there the comparisons end. Nolan’s film focuses on revenge with forays into the relationships between memory, perception and trust. Leclerc, on the other hand, is almost entirely preoccupied with questions of identity and the malleability of truth. 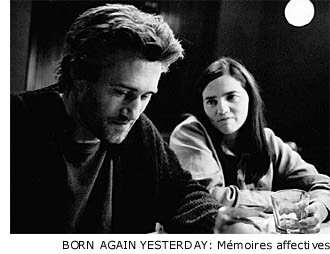 “Memoires Affectives” is the story of Alexander Tourneur, a forty something year old veterinarian who has lain in a coma, declared clinically dead, for months since being the victim of a hit and run accident. A shadowy figure appears beside Alexander’s bed in the opening scene, says goodbye, turns off his ventilator and leaves him for dead. But rather than killing him the removal of life support shocks Alexander’s system enough that he awakes a changed man, a man with amnesia, his mind a complete void. The police, still searching for the driver who ran Alexander down, now also begin the search for whoever attempted to kill him in hospital while Alexander struggles to remember anything whatsoever of his past so that he may both assist the police investigation and reclaim his lost life. What Alexander discovers is that rebuilding a life is not always a pleasant experience. Beyond the simple awkwardness of meeting a wife and child that are complete strangers to him Alexander quickly begins to piece together a less than flattering picture of his past life. His marriage is a shambles and verging on total collapse, he has a significant drinking problem and he is continually plagued by strange, violent images of a man’s drowning. Making his reintegration to daily life even more difficult is a peculiar phenomenon: when he talks with close friends and family members about past events he frequently experiences vivid visions of the events in question. Are these Alexander’s memories returning? Could be but why, then, does he always appear in these visions in the third person and why do the people he’s speaking with always deny any knowledge of the events after the visions have struck? It is as though Alexander is appropriating memories from his friends and family members and he is left is the bizarre position of not only having no memories of his own but gradually being filled with other people’s memories of himself and key events that those people no longer have any memory of. He is gradually being filled, but only by emptying those around him. Leclerc has crafted a beautiful, haunting film. The film is largely shot in the starkly gorgeous countryside of rural Quebec, a land filled with forests, lakes, mountains and cold, harsh winters, all of which Leclerc captures with a fluid, mostly handheld camera with the images washed out to match Alexander’s inner emptiness. Roy Dupuis turns in a fantastic performance in the lead role and the key supporting cast members are all solid. The film poses several powerful questions: Are we what we perceive ourselves to be? Are we what others perceive us to be? Or could we be something else entirely? 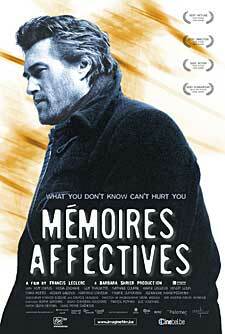 Whether taken as a straight-forward thriller or a philosophical head trip “Memoires Affectives” is a remarkable piece of work. With its themes of memory, perception, reality and traumatic secrets, this compelling film won four Canadian Genie Awards. Francis Leclerc is like a heady blend of David Lynch and Leclerc’s fellow Canadian, Atom Egoyan. The film screenings of RIIFF’s “First Look” Birthday Blow-out Benefit will take place at the historic Columbus Theatre Arts Center, (270 Broadway) in Providence, RI. On Friday, March 23rd. The special pre-screening party launches at 6:00 p.m. The film will screen at 7:30 p.m.
Tickets for the the party/reception and film is $25 (students with a valid ID will be offered a discount $15/ticket.) General Admission for the movie is a recommended donation of $10. All proceeds generated by the screening will be used for the planning and production of RIIFF’s 11th Annual Season. RIIFF is a 501-C(3) non-profit organization. All contributions are tax deductible as allowed by law. The Rhode Island International Film Festival is generously supported by WJAR TV 10, The City of Providence, the Providence Tourism Council, Clear Channel Communications, Rule Broadcast Systems, Motif Magazine, Columbus Theatre Arts Center, Newport Vineyards, Amtrak, the University of Rhode Island and individual contributions. The 11th annual Rhode Island International Film Festival will take place August 7-12, 2007.